Mallory grew up with two foster parents who terrorised her childhood; unsuitable to parenthood they threatened her, scared her and forced her into staying quiet and unseen for the many years she lived with them. The only reason Mallory survived was Rider Stark, a boy a few years her senior who protected her from the demons at the peril of his own well-being. When a fire leaves physical evidence of the unsuitable home Mallory and Rider lived in all those years, they are freed from the nightmare but at one terrible cost: they get separated. Fast forward a few years and Mallory's life has completely turned around. Adopted by two doctors who care for her deeply she now lives in a stable home and is slowly working on overcoming the emotional and physical scars of her childhood. She still has trouble speaking lengthily in front of strangers, an after-effect of being told to be quiet for most of her life, but otherwise she's doing well and she is ready to face a new milestone: high school. As if having a normal conversation with strangers isn't challenging enough for Mallory, another big shock awaits her on her first day of school. She runs into Rider, and all her feelings – for him and about their shared past – come crashing back into her life. I remember coming across Jennifer L. Armentrout years ago when I read about her novel Cursed, which, back in the day, even made my Waiting On Wednesday. 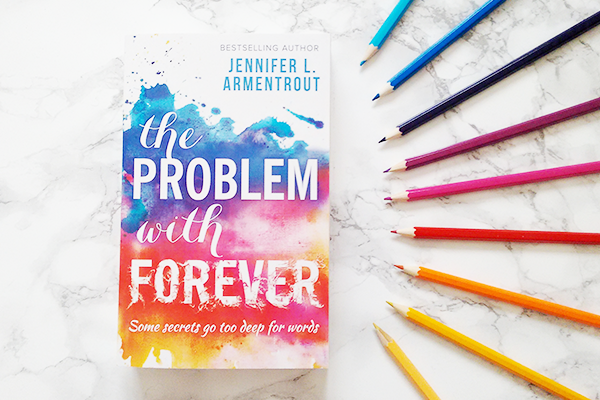 She disappeared from my radar after that, only to resurface with a vengeance with the beautiful The Problem With Forever (and I don't just mean the cover though holy crap, how gorgeous is that one?!). This is a story that needs telling but so rarely does. It realistically shows the emotional impact of the mistreatment of impressionable children and how it can have lasting effects on those involved. Mallory became quiet and invisible, not unlike a mouse, a nickname Rider gives her. The slightly older boy becomes her protector, someone who is willing to sacrifice himself for those he cares for. Even years later, when Mallory has been living in a loving home for a few years already and Rider too is taken care off, the two characters retain these characteristics; Mallory rarely talks to strangers and Rider is a fierce protector of the younger boy living in the same home as him; Jayden. You can take people away from a nightmare but that doesn't mean the nightmares stop. The things we experience as children are deeply rooted into brains and can influence every next stage in the journey of life. I loved reading all of this from Mallory's perspective because despite all the hardships she had to endure in her still young life, she is a kind human being and deserving of overcoming her struggles and fears and just be a normal teenager (for as far as there is such a thing as normal, of course). Rider, despite being screwed up from his childhood too, provided the perfect balance to her naivety and neediness, not to mention that he was hot to boot! The only character that wasn't explored to the fullest was Mallory's best friend Ainsley. Mallory was so completely, almost selfishly, focused on her own troubles that Ainsley got the short end of the stick. I loved Ainsley from the start, her contagious excitement, her unrelenting championing of Mallory and Rider, and her supportive nature despite not necessarily being returned the favour. Why then did this character only serve as a brutal eye opener to Mallory? Driving an important change in mentality just for the plot, without getting some much-needed support herself? It reminded me of something author Claire Hennessy recently said about the best friend dying (this is not a spoiler, Ainsley doesn't die) merely to make the protagonist do a complete turn around and see what has been obvious to the reader from the very first page. Before she made this very valid comment I probably wouldn't have noticed it in The Problem With Forever, but now it's painfully obvious. And that's a shame, as Ainsley is a wonderful character in her own right and she deserved more than that (at the very least a conclusion to her storyline rather than being left forgotten among those final chapters). Aside from the handling of Ainsley I loved this novel from start to finish. The Problem With Forever is an important book telling a powerful story. Even these days too many foster kids still slip through the system and with Mallory and Rider, Jennifer L. Armentrout gives these children a voice and shows the emotional effects of not growing up in a loving home, and how it can impact them even years later. Despite the harrowing premise, this is an uplifting read too. No matter what horrors people experience, most of us will overcome them to come out better and stronger. Not all of us, mind, as this book so devastatingly shows, but for most of us there is hope and we come to realise that these dark moments will not last forever. The Problem With Forever is published by Mira Ink and you can buy your copy from Foyles or your own preferred retailer. This review is part of the The Problem With Forever blog tour, make sure you check out the other stops too for more great content around this book!